Not so much knitting going on so far today. I'm on a bit of an organizing rampage. At least it's a stash-organizing rampage. I've dismantled most of my issues of Cast On, keeping only those few patterns I might actually knit and the technique articles. The technique issues are truly excellent. I've found that I often remember, vaguely, that I've seen an article about such-and-such, but then it takes me forever to locate it. Well, no more. I'm putting them in sheet protectors and sorting them into a binder by general topic: Design, Technique Fundamentals, Textures, Advanced Topics, and Finishing. I ran out of sheet protectors, so I haven't done 2006-2007 yet. However, I immediately ordered more sheet protectors and they should arrive tomorrow. I had been wanting to place an office supply order anyway, to get more of the colored tabs I mark magazine patterns with. (I discovered that, of course, my very favorite brand of tabs is a store brand, and double of course, I have no local store... it's the boonies, folks.) But I'm compulsive about stalling until I need enough stuff to get free shipping, and the sheet protectors did the trick. For my next trick, I'm going to hunt down all my really awful plastic yarn and take it to Goodwill. I've put the heel in the Oil Slick Socks and I'm a couple of inches up the leg. I need to finish these in a hurry before I cave in and start something else. Last night I bought Cat Bordhi's new book and it makes me wish I had twelve hands. Coriolis socks are imminent! Oh, and I also need to knit an entrelac sock from the Spring 2007 IK as a class model. These are what I'm knitting on today. I've recently discovered Tofutsies, thanks to a ball I got in a yarn swap. I'm just knitting them by my usual decide-as-you-go toe-up method. I think I'll call them the Oil Slick Socks because the coloration reminds me of the dark rainbow on a puddle in an asphalt parking lot. Those little metal needles are 6" size 0 Hiya Hiya stainless steel, which are now my very favorite double points. They're unbelievably light and they don't break in my purse, as happened recently with a Crystal Palace bamboo needle. I had just been to the dentist and found out I had cracked a molar and would need a crown, and then when I dropped my purse into the car, snap! I went directly to the LYS and bought the Hiya Hiyas. Aha! Would you believe that uploading works much better if your USB hub is plugged in? These are the Waving Lace Socks from Favorite Socks: 25 Timeless Designs from Interweave. I used Lorna's Laces Shepherd Sock in Lilac. 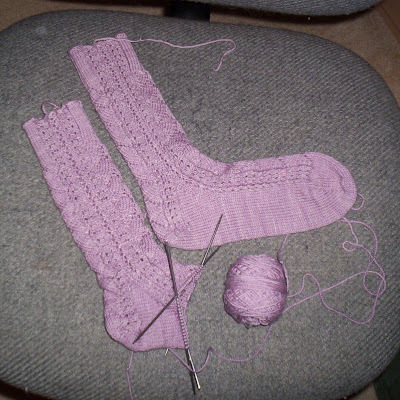 Here is my second pair of Lavender Lace Socks from Vogue Knitting On the Go: Socks Two. They are made from Lorna's Laces Shepherd Sock in Natural. I also made a pair for my friend Traci a while ago in Sage Shepherd Sock. In fact, I just noticed that these two pairs of socks were by the same designer, Evelyn Clark. Last pair for today: Charlene Schurch's Ripple Weave Socks, from the Fall 2006 issue of Vogue Knitting. More Shepherd Sock, this time in Blackberry. Yes, that's my white leg. Be warned that the stitch pattern chart has an error in Row 3; the yarnovers should be one stitch farther to the left. Study rows 1 and 5 and you'll see what I mean.